Don Payne, bass; Billy Higgins, drums. The numbers in the album are all Ornette Coleman originals and were written from five to six years ago. It is in character with Coleman's credo as a writer and player that, as Walter Norris explains, "Each time we played the tunes we'd change them around a different way. We did everything possible we could do with them." "These are tunes," adds Billy Higgins, "that make you think, and like his playing, they're natural. They're his own." "Ornette," concludes Don Cherry, "always writes and plays how he feels." As for the tunes, "Invisible" is thus titled because it's rather difficult without concentration to discover the tonal center of the song. The key is D flat. "The melodic direction is pretty free," notes Ornette. "Actually, these are regular intervals that any musician would use anyway, but put together this way, it's very melodious." "The Blessing" was written in a park at Fort Worth at one or two in the morning. It's in A and has for me the most appealing melody line of all the originals. I'm intrigued in this and the other Coleman compositions by what Don Cherry points out as the rhythmically free nature of Coleman's melodies. "They don't run with the rhythm." Accordingly, when his rhythm section feels free enough to play counter-rhythms and otherwise liberate the time, it finds the melodies unusually plastic. 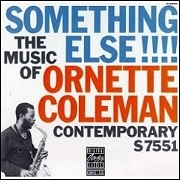 "Jayne" is Ornette's wife and the song is in the key of G. It is necessary to note that these are Coleman's earlier compositions and that until he and his men feel the entire freedom toward which they're striving, songs with a tonal center are more practical, for the most part, for group expression. In talking about this tune, Ornette went on to say about his general goal that the direction of a tune in performance can vary from bar to bar. "If I don't set a pattern at a given moment, whoever has the dominant ear at that moment can take and do a thing that will release the direction from being what it always is into something better. "Chippie" is named for his friend Blackwell's son. "I wanted to keep a remembrance of the type of love of life and respect for music we had." It is based on the key of F and is an eight-bar form. "The Disguise" was so titled because it's in D, a difficult key often for Eb and Bb instruments. It's structured in thirteen-bar units. "It has a brightness; it seems like it's in one key and the melodic interpretation is coming from another key. "Angel Voice" was, in a sense, brought into being through Webster Armstrong, a singer, who is currently a biology professor in Texas. "He used to tell me the musicians of his day would always talk about 'playing the bells.' They could hear free voices coming from the skies. I could just imagine voices which you couldn't see but could hear; they'd have to be angel voices because we see humans. "Alpha" came about when Ornette and his cousin were playing a tune one day, and four notes suddenly came to Ornette from which he developed this song. It's a twelve-bar blues pattern. "When Will The Blues Leave" strikes me, as do all Ornette's other tunes, as having an unusually talking-like line. In other words, Ornette's writing and his playing are of a piece, both having the natural, individual--and not always predicable--patterns of human speech. About "The Sphinx" Ornette recalls, "James Clay and Donald Cherry came over to the house and I got them to go over this tune. The sound was such a foreign sound that "The Sphinx" was the only thing I could think of that would describe it. "I think one day," says Ornette, "music will be a lot freer. Then the pattern for a tune, for instance, will be forgotten and the tune itself will be the pattern, and won't have to be forced into conventional patterns. The creation of music is just as natural as the air we breathe. I believe music is really a free thing, and any way you can enjoy it, you should." I expect the very first jazz players were much like Ornette ("singing horns" they've been called by Fred Ramsey) except that Ornette has also absorbed all that's happened since. --NAT HENTOFF, from the liner notes.